The Pantanal is a vast wetland region spanning thousands of square kilometres across Brazil, Paraguay and Bolivia. Even though it's not as packed with biodiversity as the Amazon, the visibility of its wildlife rivals any other corner of Latin America. But worryingly, a recent study has highlighted a toxic threat faced by the Pantanal's apex predator. High levels of mercury have been found in the fur of the resident jaguars. In fact, the results suggest one of the spotted cats sampled as part of the study had the highest levels of mercury recorded in any wild animal to date. The researchers obtained fur samples from 12 tranquillised jaguars in the north and south of the Pantanal. The north, towards the city of Poconé, has a history of extensive gold mining, says Dr Joares May Júnior, lead author on the study and researcher at Universidade do Sul de Santa Catarina. This is where the cats with the highest mercury levels were found. 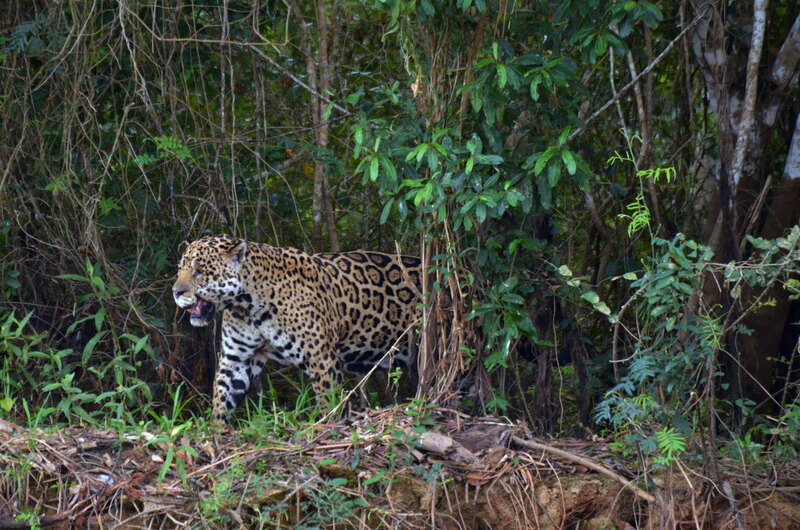 In comparison, jaguars in the south of the Pantanal, in an area free from gold mining, showed only low traces. Mercury is often used in small-scale mining as a quick and easy way to separate gold from other materials. Near Poconé, the average contamination levels were found to be around 20 times higher than in the south. And according to May, one of the jaguars sampled displayed 45 times the amount of mercury in its fur compared to the south-dwelling cats. Jaguars aren't fussy eaters: they'll happily munch on fish, wrestle with a caiman or nab a capybara as part of their wide-ranging diet. That's how they accumulate mercury in their system. When the pollutant is released into the environment, it's broken down by bacteria into toxic methylmercury, which is then eaten up by microorganisms. These, in turn, are gobbled by fish or insects, and the process continues up the food chain. The toxins that build up in the smaller critters eventually end up in the king of the Latin American jungles, only in greater concentrations. How grave of a threat the mercury poses to the jaguars of the Pantanal isn't entirely clear at this point, given this study's small sample size, and the fact that only one other study has looked at mercury levels in this iconic species. Back in 2012, researchers in Colombia tested teeth taken from dead jaguars near the country's Paramillo National Park. They found that the levels of mercury were below harmful limits. According to that study, the toxin was probably released into the water supplies by gold miners, as well as industrial pollution farther upstream. On the face of it, it seems evident that mercury in the jaguars' fur is a bad sign. May emphasises, however, that at this point we can't draw any firm conclusions about whether the cats are actually unhealthy. "For now, we can say we've found too much mercury – what that means, we don't know yet," he explains. Globally, jaguars are listed as Near Threatened by the IUCN. Across their range, the spotted cats face the loss and fragmentation of their habitat, as their territories are carved up into smaller and smaller areas. Hunting, whether for the illegal trade or in retaliation for predation on cattle, also threatens their survival. In the Pantanal, jaguars face similar challenges, yet populations appear to be healthy despite this, explains Rafael Hoogesteijn, conflict-management director for Panthera's jaguar programme in the region. "At least in our area, we are doing regular camera-trapping and the quantity of jaguars has been maintained and has even increased over the past years," he notes. Rampant poaching between the 1950s and 1980s almost eradicated jaguars in these parts, but populations are now rebounding. Hoogesteijn says hunting was once so intense that poachers struggled to find the sought-after big male cats. Today, the situation looks much brighter: jaguars are even showing up in areas where they've not been seen for the past twenty or thirty years, he adds. But if habitat continues to be lost and populations become isolated, the quantities of heavy metals like mercury could in time come to affect the jaguar's reproduction. The next step, May believes, could be to delve deeper into the problem and try to answer this very question: comparing the number of cubs born to jaguars living near gold mines with birth rates farther away, for instance, could illuminate the health risks posed to the species, he says. Jaguars can also act like the canary in the, well, gold mine. They provide scientists with an indication of how the entire ecosystem is faring, including the region's human inhabitants. "A high level of mercury in jaguars could mean the same high level of mercury for local people," May explains. At this point, it's uncertain if (and how) mercury is affecting the Pantanal's jaguars. In the long run, it could become another threat to their survival, but more research is needed to fully understand the scope of contamination. For now, as Hoogesteijn says, we have an important baseline to work from and inform future studies. 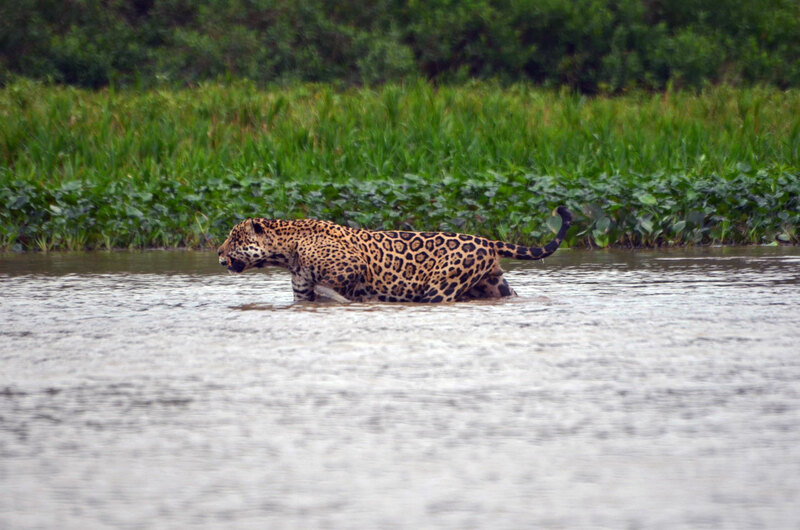 And for the moment, at least, despite all the trials it faces, the jaguar appears to be going strong – and reconquering its lost territory – in the world's largest wetland.